The world needs more health workers. The global population is growing and aging—by 2030, there will be at least 300 million more people aged 65 years and above than there were in 2014. This demographic shift, along with changes in diet, pollution, and other factors, are driving an alarming increase in the incidence of chronic illnesses. At the same time, humanity is facing a sharp resurgence of antibiotic-resistant infectious diseases. Meanwhile, new opportunities for personalized care driven by genetics, genomics, immunotherapy, and integrative therapies are beginning to change the skills required to power the modern health system. I’ve always been passionate about innovation in healthcare and have spent much of my career exploring the application of machine learning in biology and health. The sector presents a huge opportunity for meaningful technological transformation that can improve health outcomes around the world and reduce the cost of healthcare for individuals and society. As demand for skilled health workers continues to rise (it is estimated that by 2030 healthcare related jobs could grow by 80 million to 130 million), widely accessible, high-quality health education will become critical to tackling the acute shortage of health workers, as well as equipping them with new technology and data skills to drive the industry forward. Today, I’m excited to announce that Coursera and 15 top-ranked health institutions are coming together, united by a shared commitment to shape the modern health economy and to provide access to flexible and affordable education options for the next generation of healthcare workers. 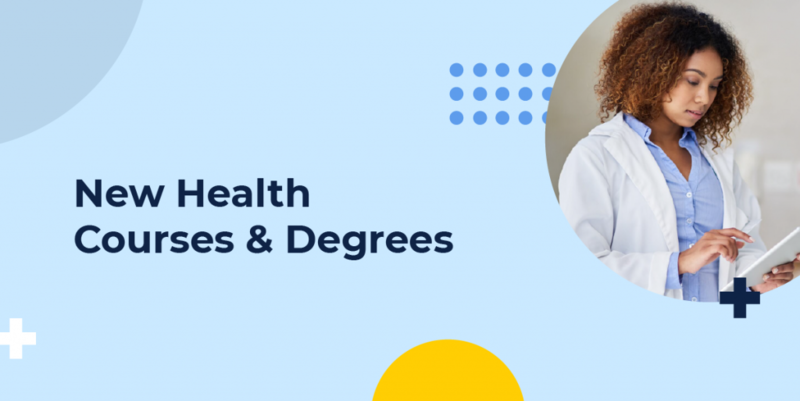 As part of Coursera’s new health content vertical, our university partners will be launching 100 new courses and 30 new Specializations throughout 2019, as well as opening enrollment to two degrees in public health – Master of Public Health from University of Michigan and Global Master of Public Health from Imperial College London. Directly addressing the skills shortage in the fields of Health Informatics, Healthcare Management, and Public Health, the content prepares learners for many in-demand jobs including Clinical Analyst, Bioinformatics Scientist, Hospital Administrator, Healthcare Manager, Nursing Director, International NGO Worker, Researcher, Community Health Coordinator, and Policymaker. Designed for industry practitioners as well as those looking for a career in healthcare, these programs are delivered by top-ranked health universities including Emory University, Columbia University, Imperial College London, Johns Hopkins University, University of Michigan, University of Colorado, University of Minnesota, and more. Coursera and its partners have a long history of democratizing access to education. Together, we have equipped millions around the world with the knowledge and skills required to enter sought-after careers in business, technology, and data science. By making cutting-edge health education accessible, Coursera is continuing on the promise of being a platform that helps people around the world transform their lives, equipping them with skills they need to advance their careers and impact their communities. You can read more about our new health content vertical in our press release or visit coursera.org/health to enroll in a new health Specialization or degree. You can also explore the full collections across our three health domains and beyond — Health Informatics, Healthcare Management, and Public Health.